Have you heard the game-changing news? For the first time ever, astronomers have observed the visible counterpart of a gravitational wave source. Gravitational waves were detected passing by Earth on 17 August, and telescopes around the world leapt into action to locate their source — spearheaded by ESO’s fleet of telescopes in Chile. Together, this global collaborative effort observed both gravitational waves and light from the same event, indicating that the source was the merger of two neutron stars. The drop-of-a-hat observing campaign involved dozens of scientists across the globe, and we asked two of them what it was really like to experience such a historic discovery first-hand. 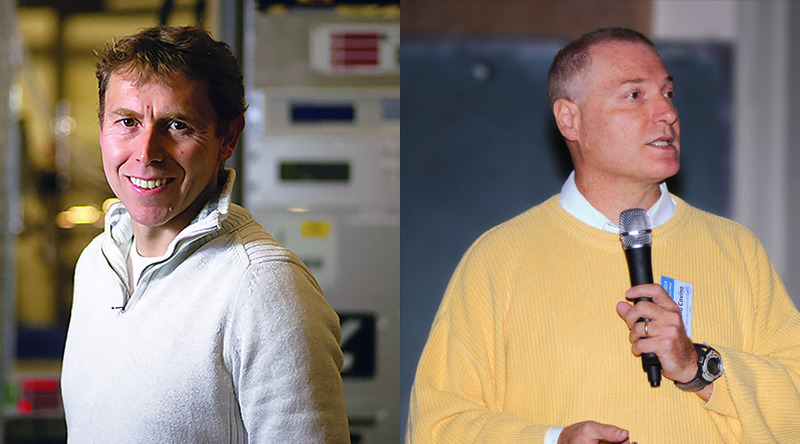 Here, we talk to Stephen Smartt (Queen’s University Belfast, UK) and Stefano Covino (INAF–Osservatorio Astronomico di Brera, Italy). Q: It all began on 17 August 2017. Tell us about the moment you received that fateful notification. Where were you? What were you doing? Stefano Covino (SC): The middle of August is the holiday period in Italy, so on 17 August I was relaxing at my place with my young daughters: Sofia (5) and Aurora (almost 3). My wife Maddalena, a medical doctor, was busy at a nearby hospital. I was enjoying spending time with my girls when my smartphone began to ring obsessively. When I unlocked it I found a series of messages, some automatic, some with comments from my colleagues at the GRAWITA collaboration, in particular from Marica Branchesi, our LIGO–Virgo expert — a new gravitational wave event had been reported! Stephen Smartt (SS): I’d just sat down at my computer after a lunchtime run, feeling great, when the alert flashed up at 14:22. Suddenly I felt even better because LIGO and Virgo had just reported a gravitational wave signature — probably caused by neutron star binary merger, which we’d never seen before. When I learned that Fermi and INTEGRAL had reported a gamma ray detection within two seconds of the LIGO Hanford timing, it was truly a wow! moment — this is what we’d been waiting for. Q: Why was this such an exciting moment? SC: Well we’d actually been alerted to another event just three days before, but the preliminary analysis of this new event indicated that it was the result of a neutron star merger. This was partly unexpected but intensely desired, because this kind of event is predicted to have a visible counterpart, so we can observe the aftermath with telescopes all over the world. In an instant, we had the chance to link gravitational waves and electromagnetic astronomy — something that had never been achieved before. Wow! SS: Like Stefano said, we’ve seen several of these kinds of alerts before. Sometimes they come at inconvenient times — like back in 2015, I was just about to turn in on Boxing Day when the highly-significant second black hole merger event was found by LIGO and it was an all-night scramble to marshal the Hawaiian Pan-STARRS and ATLAS telescopes for the coming darkness, postponing my holiday. But this time, it looked like the gravitational waves were produced by the merging of two neutron stars, which was predicted to be accompanied by a bright burst of electromagnetic radiation — and if we could find the source, it would actually be the first identification of a gravitational wave source. The race was on! Q: So the next step was to find the source — how did you know where to look in the sky? SC: That’s the tricky part. Just because we were incredibly excited didn’t mean the way forward was easy. Gravitational wave detectors are wonderful pieces of technology, but they’re currently only able to tell us the region of sky where the event was measured, not a specific location. This time, however, we got lucky. The Fermi and the INTEGRAL high-energy satellites detected a signal a couple of seconds after the gravitational wave event — an amazing feat by itself! And by combining the information, we managed to narrow the source down to a reasonably small area of the sky. SS: Actually, the very first map of the sky from LIGO–Virgo showing us the source’s direction was simply enormous. It covered a region of about half the whole sky, which didn’t narrow down our search at all! Maybe this is just chance coincidence, I thought. We’ve seen them before. But it turns out the huge area was just due to a noise glitch, and by midnight (GMT) on that same day, LIGO–Virgo had heroically reanalysed all the data and come up with a new, smaller region in the south, low in the sky at dusk. This image shows areas of the Milky Way where previous cosmological events have been localised by LIGO, starting with gravitational waves detected in 2015 (GW150914, LVT151012, GW151226, GW170104). 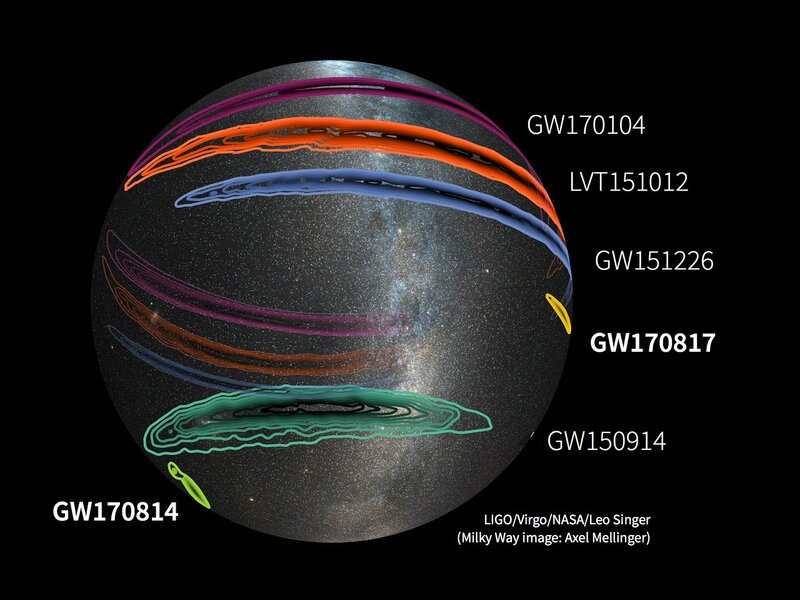 More recently with the addition of VIRGO the LIGO–Virgo network was able to more accurately localise gravitational-wave signals (GW170814, GW170817). The “yellow banana” is the only gravitational wave source in this image to have been produced by merging neutron stars, the others all being caused by merging black holes. Q: But how did you narrow it down to find the source itself? SS: There are a couple of ways we could have done this. Firstly, we could have used a wide-field telescope to scan the region (which is about the size of 100 full Moons) and spot what new objects had appeared. Secondly — and this is the option that many telescopes went with — we could plausibly guess that the object is most likely located where most of the other stars are, and so many teams decided to take a focused look at the 10 or 100 biggest galaxies in the region. Handily, LIGO–Virgo also estimated how far away the event was (about 130 million light-years) which gave everyone a three-dimensional space to search in. Picking the biggest galaxies from that actually wasn’t too hard. Q: Who made the initial observations? Was there a call to action for astronomers around the world? SS: Pretty much! The position of the source, low in the sky, was not great for observatories in places like Hawaii but was well-placed for Chile. So all of a sudden, Chile became the best astronomical site in the world to search for the electromagnetic counterpart of the event. Of course, the big, wide-field telescopes DECam and VISTA were immediately scheduled, but even small telescopes (40-cm to 1-m) were enlisted to conduct interesting searches! SC: With a few colleagues from the INAF–Brera Astronomical Observatory — Sergio Campana, Paolo D’Avanzo and Andrea Melandri — I planned a set of observations with the REM telescope, which is small, rapidly-pointing INAF telescope located at ESO’s La Silla Observatory. We, along with many other colleagues around the world, targeted some of the brightest galaxies at a compatible distance in the sky area of interest. Still, it was a very difficult search because the area was observable only for a limited amount of time after sunset. Q: And what did you find that first night of observing? SS: Within the first hour of observing in the Chilean dusk, seven telescopes spotted the same source of light. It was first announced as the possible counterpart by Ryan Foley’s University of Santa Cruz team using the little Swope 1-m telescope, at Las Campana, a few tens of kilometres from La Silla. The new source was in the galaxy NGC 4993, an otherwise fairly normal and unremarkable galaxy at the same distance that was estimated by LIGO–Virgo. 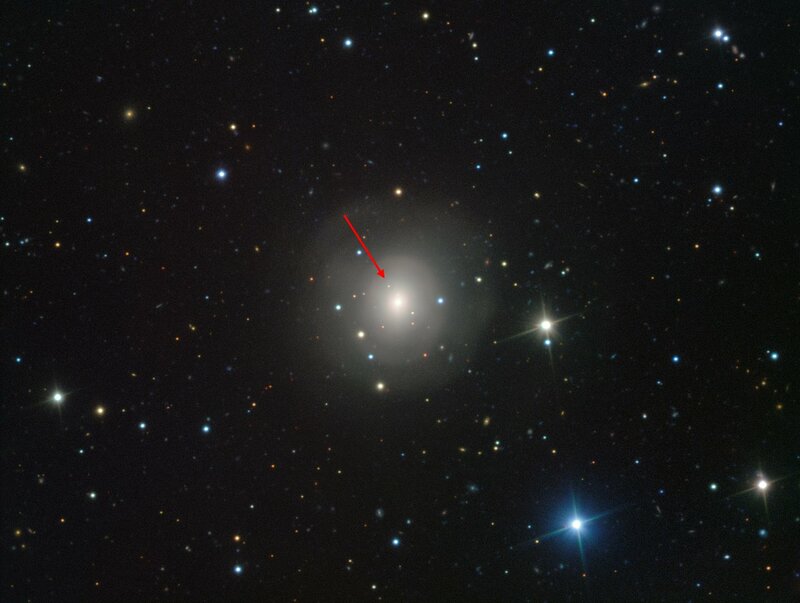 Six other teams also reported the same detection within those first few hours, having guessed that this galaxy had a good chance of hosting the object. SC: The REM telescope was scheduled to observe NGC 4993 20 minutes later, and indeed our observations also showed this bright, previously-uncatalogued source. The Swift satellite also observed it, quite bright in the ultraviolet part of the spectrum. Is it the counterpart we’re looking for? I wondered. Is it actually related to the gravitational waves event? It was still difficult to say; finding new sources is not very unusual. Only direct observations could reveal the nature of this source. But the visibility period of the field was over. From Chile, we had to try again the next night. Q: Did other telescopes around the globe pick up where you left off? SS: They sure did. As night marched west across the globe, the source was visible but very low in the sky for the next observatories able to spot it — in Hawaii. Six hours later, Subaru and Pan-STARRS announced they had picked up the source. I’ve been involved in Pan-STARRS for a long time and it’s a great facility to do this type of search. When Ken Chambers (Pan-STARRS Director) heard the news about the detection, he decided to focus on getting colours for the object in the 15 minutes or so it was visible. Everyone was thinking the same thing — is this actually it? We followed it dutifully over the next few nights all around the world. Ken and his expert observing team in Hawaii drove Pan-STARRS to its elevation limit, pointing “down in the dirt” at twilight to spot the source low on the horizon. With our reliable Pan-STARRS data analysis pipeline, we could carefully monitor whether the object changed its brightness. The staggered observations from Hawaii, then Australia and South Africa and back to Chile again, showed us the object was fading fast. We wondered whether it could still be a variable star from our own galaxy, getting in the way of our observations, or perhaps even a distant supernova. But if we ruled out those two possibilities, the object was a real contender for the source of the gravitational waves. It was in the same area of the sky, at the same distance as LIGO–Virgo estimated... Everyone was thinking the same thing — is this actually it? Q: So these observations continued over many days — what were they like? SC: The day after the discovery of the source, we decided to investigate its nature with the best resources we had. And so the intensive campaign began, stretching over 10 days following the initial report. It was frankly impressive. The days were filled with frenetic and exciting activity. My team was remotely watching different units of ESO’s Very Large Telescope pointing at the same targets and simultaneously securing polarimetry, spectroscopy and photometry. It was truly a fusion of technology and passion at their best. And day by day, the evidence became more convincing that we were witnessing an astrophysical object that had been previously theorised, but never observed before: the long-sought connection between gravitational waves and electromagnetic astrophysics. SS: Observations took place over the next 10 days all around the world. For my team, we very luckily had five nights of the extended PESSTO survey coming up on ESO’s New Technology Telescope in Chile. A rapid telecon led to plans for the coming nights with our two observers Joe Lyman and David Homan. Janet Chen triggered the MPG/ESO 2.2-metre telescope to observe NGC 4993 every night. We needed a spectrum — the first one came from Magellan, taken within the first night by Maria Drout, and was just blue and featureless. We often see transients like this, so it was certainly unusual but not conclusive. As night came round again 24 hours later, we got that first conclusive spectrum. I waited at home, in contact with Joe and David, and they sent through the spectrum as soon as the exposure finished. As the first spectrum plot popped up on my screen, at 02:14 am on 19 August, I was thinking this really could be decisive. It was most definitely not a supernova, not a variable star, and not anything I’ve ever looked at before. PESSTO has classified over 1000 astronomical transients and none of them look like this. I sent the description around to PESSTO and the global network of observers. There was no hydrogen, helium, oxygen, calcium, silicon, or carbon in the spectrum. Others started to get their spectra from the optical to infrared too; we triggered ESO’s Very Large Telescope, and the reports all lined up. My former student Matt Nichol, now at Harvard, saw the same thing as me from his spectrum at another Chilean telescope on the same night. At this point, about 36 hours after the gravitational wave discovery, everybody really thought this was it: the electromagnetic counterpart. Q: Tell us: why this is such an important and exciting result? SS: Honestly, it’s a triumph for a very talented group of theoretical astrophysicists. Over the last 20 years, they had predicted that neutron star mergers would produce electromagnetic signals just like what we were seeing: blue, turning red, fading fast. The light is powered by heavy radioactive elements that were created in the first few moments of the merger. The name “kilonova” was coined for this phenomenon in 2010 by Brian Metzger — because it’s 1000 times brighter than a nova. It’s quite amazing that these physical models predated the discovery by years, but ended up being very similar to the data that we actually saw! Q: After the team makes their observations, what’s next in the scientific process? SS: In short: you write papers and get them published! Knowing how groundbreaking this was — knowing that this was probably the optical counterpart of merging neutron stars and the first identification of a gravitational wave source — I realised we had to act fast to analyse our observations thoroughly and get our results out there. There’s a lot of intellectual horsepower in the PESSTO, Pan-STARRS, and ATLAS teams, and I knew if I could harness that talent rapidly, then we could quickly work out what was going on. The team was formed and off we went — and you can read the result in the press releases and in our Nature paper. Superb work by our theory team of Anders Jerkstrand, Michael Coughlin, Stuart Sim and Luke Shingles showed that this is indeed a kilonova, associated with merging neutron stars! SC: I began to work intensively on our team's paper along with Klaas Wiersema (now at the University of Warwick in the UK), who is co-responsible for the polarisation programme. It's always a special period when you finally have your data, notes and plots and then try to organise everything in a coherent way. It was also a period of intense, rapid-fire interaction with the journal editors, who made exceptional efforts to allow us to publish at the right time at the end of the embargo period. Q: It must have been an incredibly busy and challenging period. SC: It really was! I didn't sleep a whole night for the first couple of weeks after the event, but we were so excited that we didn't really feel tired. SS: As it happens, as all this science frenzy was going on, I was in the middle of a training program for the Dublin Marathon. I’d been fortunate to be chosen by Irish Olympic Athlete Paul Pollock to be part of his first coaching project, Dream Run Dublin. The peak training period ran from mid-August to early September, so the day after the spectrum came through, I ran 20 miles faster than I’ve ever run before. Running keeps my head clear. In the middle of writing and analysing and checking all data, sometimes you can hit a wall. I find that getting outside and going for a run can lift this mental block. Could I keep this going, writing the paper with a deadline six weeks away (I could see the late nights coming!) and also keep up with the coaching program, with the goal of breaking 3 hours for the marathon? “Of course you can — go for it,” my wife Sarah said. “Easy,” my coach said — and he was right. The training is now over and in two weeks, I’ll be waiting at the starting line of the Dublin Marathon. 2:59:59 will mean success; 3:00:01 will mean failure. Let’s wait and see. In any case, the kilonova paper is finished and published, and the marathon of a new era of astronomy is underway! Q: And finally: How did it really feel to be part of such an extraordinary and landmark event? SS: I’ll remember these eight weeks for a long time. I’m very fortunate to work with a great group of scientists and it has been a privilege and a pleasure to lead the team and be part of this truly historic event. SC: It was a privilege to be on the frontline of these epochal events. Of course, we all like to see our work recognised and feel that we’ve contributed to our field of research, but this time was different. You had the precise feeling that something historic was happening, and I’m proud to have been a small part of this big event. Most highly-talented scientists have never had this privilege. These past two months, I’ve also been thinking a lot about the large number of colleagues who worked so hard, day and night. I know a good fraction of them personally, and a few I count as friends. We began more or less together when we were much younger, targeting gamma-ray burst afterglows, and almost twenty years later we’re still here pointing “our” telescopes at a new category of astrophysical sources. We have been a lucky generation of astronomers! Stefano Covino is an astronomer with the Istituto Nazionale di Astrofisica (INAF), currently working at Osservatorio Astronomico di Brera. His primary research interests are gamma lightning, gamma ray bursts and high energy astrophysics. He has worked on robotics for telescopes and optical instruments as well as in many foreign institutions. Stephen Smartt is Director of the Astrophysics Research Centre at Queen’s University Belfast. His work focuses on superluminous supernovae and the stars that produce them. He is head of the Pan-STARRS Survey for Transients which leads the world’s supernova discoveries, and he is PI and Survey Director of PESSTO, the Public ESO Spectroscopic Survey of Transient Objects.